The best solution for most people is undoubtedly an AquaGuard Whole of House Filtration System. These Filter Systems are remarkably easy to install and because our Whole of House Systems are scaled down Commercial Systems rather than scaled up Domestic Undersink Systems their annual maintenance costs rarely exceed $80 per year – compared to the $100’s per year it can cost to maintain a scaled up Domestic Undersink System. AquaGuard Whole of House Filter Systems are a unique design which combine either 2 or 3 filter components – depending on the model – vertically, in series. AquaGuard Whole of House Filters have an effective filtration capacity of up to 45 litres per minute and reduce water pressure by less than 5% – easily catering for even the largest household – up to six taps can be running at the same time without affecting pressure or filtration efficiency. They provide 1 micron sediment and bacteria protection, the best quality commercial grade activated charcoal applicable to the particular situation and KDF enhancement of both the bacteria and activated charcoal filters. The KDF filter also offers protection to household appliances like kettles, dishwashers and hot water systems, as well as reducing those ugly white deposits on shower screens, sinks and taps. This KDF filter will become increasingly important to home owners as the trend toward Solar Hot Water and Continuous Flow Gas Hot Water Systems increases in popularity. These styles of Hot Water Systems are much less robust than the old style Electric Hot Water Storage Tank Systems and damage from dissolved minerals in water supplies should be a real concern. In fact Continuous Flow Gas Hot Water System warranties already specifically exclude damage caused by bore water supply for this very reason. Modern Ceramic Disc Tapware also benefits from the 1 micron particle filter which prevents any fine sediment or grit from damaging the internal sealing surfaces of Ceramic Taps. Whole of House Filtration should be your number one choice for home filtration – every tap, appliance and every person will benefit from one of these AquaGuard Whole of House Filtration / Purification Systems. 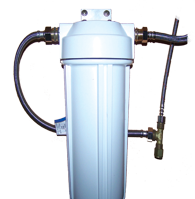 Undersink Water Filter Systems are a popular choice for many households in Australia. AquaGuard – Australian Water Filter Systems have recently introduced the new Full Flow Ezy Fit range of Undersink Systems to take advantage of the new generation of quality high performance carbon filters now available. Extreme high pressure polypropylene housings replace the leaded PVC housings of times past. 12mm brass fittings and 12mm stainless flexilines are used for connection instead of the old style 6mm plastic fittings and plastic tube. Gone also is the need for an extra tap, new NSF approved high performance carbon filters can produce 8 litres of treated water a minute and more than 80 000 litres before they need replacing – consequently there is no longer a need to drill an extra hole for a new tap in the sink. The other great feature of the new AquaGuard Full Flow EziFit Undersink Filter Systems is the ease with which they can be fitted – 10 minutes is all the time needed to fit these systems to a sink with a Mixer tap connected with flexiline connections. If the cold water tap is connected with hard copper line then an appropriate set of connection fittings is available and the fitting time will be extended to 20 minutes. AquaGuard Full Flow Ezi Fit Undersink Filter systems are available in single, twin or triple filter configurations. 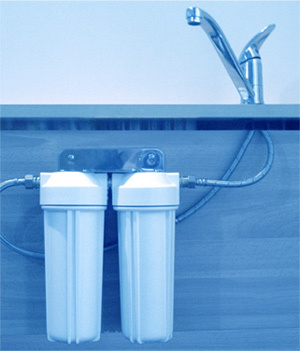 Single Undersink Filter Systems are designed for households of two or three persons with town water supply – town water typically contains little or no sediment, certainly not enough under normal circumstances to impede the flow of the carbon filter and definitely not enough to warrant the use of a sediment filter. Twin Undersink Filter Systems are designed for two typical Australian situations. Firstly, households of more than three persons using town water, these “heavy duty” town water filtration systems come complete with two carbon elements capable of producing 16 litres of filtered water per minute – and up to 160 000 litres of water before it needs to be replaced. These units are also used in commercial kitchens where high volumes and high flow rates of filtered water are required. Secondly, all households with tank water, the role of the water filter system changes somewhat when filtering tank water with the emphasis on removing sediment, bacteria and organic tastes from the water. Twin Undersink Systems for tank water are configured with one sediment filter and one carbon filter, both of which must be capable of eliminating cysts from the water as it passes through the filter system. The carbon filter plays an important role in removing chemical residue from the sediment, tank and supply line materials and tastes from organic matter that may end up in the tank as well as a secondary barrier for the elimination of bacteria from the filtered water. Both filter elements should be changed at no more than 12 month intervals, the sediment filter may need to be changed or cleaned more frequently than that interval. How quickly the world of water filtration can change – a few years ago Reverse Osmosis was the ultimate in water purification – now it is about to be confined to the very narrow application of “Medical Use” only. “Hollow Glass Fibre” is a new filtration format that is already available and expected to replace Reverse Osmosis completely in the near future. At this time however, Domestic Reverse Osmosis for all it’s disadvantages as a water wasteful , energy hungry, high maintenance purification system remains the top of the tree for sheer efficiencey capable of producing essentially pure water. The very latest in water filtration / purification technology capable of filtering down to 0.002 microns, below the standard needed to filter out viruses from water and the same filtration efficiency as large scale desalination reverse osmosis plants like the installation at Tugun on Queensland’s Gold Coast. The advantages of HGF Water Purification Systems are considerable. HGF Water Purification Systems are more efficient in terms of water waste, 90% efficient in fact in comparison with Reverse Osmosis which is at best 40% efficient. HGF Water Purification Systems are more efficient in terms of flow rate and pressure drop, hence HGF can be installed without the need for a collection tank and pressure system. HGF Water Purification Cartridges can be as compact as carbon cartridges, but the HGF function is quite different, it serves to block physical particles or bodies from the filtered water, like RO it still needs the assistance of carbon elements to “polish” the water for taste before it is pleasant to drink. HGF can filter out bacteria and all VIRUSES from tank water, current domestic filtration units can only filter out bacteria, so people in tropical areas where mosquito borne viruses occur can now have absolute bacterial and viral protection in their home filtration system. Triple Undersink Filter Systems are configured for two specialist situations. Firstly for large households who alternate between tank and town water supplies. These households still require the high filtration capacity of two carbon filters to deal with the chlorine and taste in the large volume of water that the household uses but periodically switch over to tank supplies when they are available and require the added function of sediment and bacteria filtration. Secondly these Triple Undersink units are installed in large commercial kitchens where water use is vitually non stop, dishwashers and steam ovens can also be connected via these large volume filter systems. A lot of people are led to believe that they can’t have effective filtration without a pump on their water supply – definitely not the case. Simple effective filtration of tank water down to 0.36 microns – that will effectively remove all bacteria and many viruses is available and at a remarkably low cost. These units can be fitted quite easily, they are very efficient and provide much needed protection against waterborne bacteria like Giardia, Cryptosporidium and E Coli – the filter elements are NSF certified as such. Please don’t be misled by most of the Countertop Gravity systems like Brita – these systems are not capable of removing bacteria, their function is simply to adjust the taste of water – useful for chlorinated town water useless for tank water. The gravity fed countertops with Doulton/Fairey filter elements are the exception, look for the Australian made systems with Doulton/Fairey filter elements inside. For years Bench Top Filters were the least expensive, most easily installed “Best Practice” solution for a Home Water Filter System – provided they were fitted with an appropriate filter. The introduction of the AquaGuard EziFit Full Flow series has taken away the “easy installation” advantage that Counter Top Filter Systems previously held. Their suitability now is confined to that of a “Travellers Filter” for people going on holidays, in almost all their previous applications they have been superceded by the AquaGuard EziFit Full Flow Filter Systems. THe biggest disadvantage of Counter Top Filter Systems is the hosing that connects from the sink tap to the filter housing – when you are on holidays it is an issue you can accept, but when you’re back home it’s an issue that can test your patience.